Other affiliations, such as membership in a Sufi order, may overlap with Sunni and Shia identities. Although Sufism has a long history within Islam, relatively few Muslims describe themselves as Sufis or say they belong to a particular Sufi brotherhood. Self-identified Sufis are most prevalent in sub-Saharan Africa and South Asia. The overwhelming majority of people who identify as Muslim today were raised within the Islamic faith. In sub-Saharan Africa, which has some of the countries with the highest percentage of people who have switched faiths since childhood, most who have converted to Islam have done so from either Christianity or traditional African religions.10 In other regions, nearly all adult Muslims who were not raised in the faith grew up in nonreligious households. In 20 of the countries surveyed, half or more Muslims identify as Sunni. 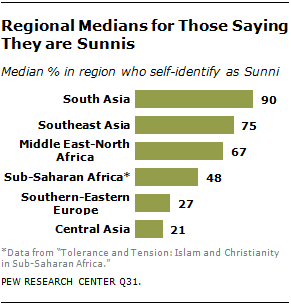 Self-identified Sunnis make up a high percentage of Muslims in South Asia, Southeast Asia, and the Middle East and North Africa. Across these three regions, the median percentage of Sunnis is two-thirds or more. About half the Muslims surveyed in sub-Saharan Africa self-identify as Sunni. In Central Asia and across Southern and Eastern Europe (Russia and the Balkans), by contrast, self-identification as Sunni is less common. Across both regions, the median percentage of people identifying as Sunni is fewer than three-in-ten. Many Muslims worldwide choose not to affiliate with a specific sect but volunteer that they are “just a Muslim.” This affiliation is most common in Central Asia and across Southern and Eastern Europe; in both regions, the median percentage stating they are “just a Muslim” is half or more. In Kazakhstan, nearly three-quarters (74%) of Muslims volunteer this response, as do more than six-in-ten Muslims in Albania (65%) and Kyrgyzstan (64%). In sub-Saharan Africa and Southeast Asia, substantial minorities also consider themselves “just a Muslim” (medians of 23% and 18%, respectively). And in three countries – Indonesia (56%), Mali (55%) and Cameroon (40%) – “just a Muslim” is the single most-frequent response when people are queried about their sect. Identification as “just a Muslim” is less prevalent in the Middle East and North Africa (median of 12%) and South Asia (median of 4%). In addition to Muslims who identify as Sunni, Shia or “just a Muslim,” the survey finds substantial percentages of Muslims who express affiliation with other sects or movements. For instance, many Muslims, particularly in sub-Saharan Africa, identify as Ahmadiyyas. (See Glossary). This affiliation is most common in Ghana (16%), Tanzania, (15%), Cameroon (12%) and Liberia (10%). Based on how Muslims self-identify in the survey, the 38 countries where the questions were asked can be grouped into four categories: 1) predominantly Sunni; 2) mix of Sunni and Shia; 3) predominantly “just a Muslim”; and 4) countries with no prevailing sectarian identity. These categories do not fully overlap with regional divisions, but certain geographic patterns are evident. For example, countries without a clear, dominant sectarian identity are concentrated in sub-Saharan Africa, while nations where “just a Muslim” predominates are found mostly in Central Asia and across Southern and Eastern Europe. For some Muslims, another layer of identity comes from membership in a Sufi order, or tariqa. Also known as brotherhoods, Sufi orders represent a mystical movement within Islam that emphasizes the possibility of gaining direct knowledge of God through euphoric worship and other practices. These orders can fall within either Sunni or Shia Islam. Identification with Sufism is highest in sub-Saharan Africa. In 11 of 15 countries surveyed in the region, a quarter or more Muslims say they belong to a Sufi order, including Senegal, where 92% say they belong to a brotherhood. The Tijaniyya order is the most common across the region, with at least one-in-ten Muslims identifying with this brotherhood in Senegal (51%), Chad (35%), Niger (34%), Cameroon (31%), Ghana (27%), Liberia (25%), Guinea Bissau (20%), Nigeria (19%), Uganda (12%) and the Democratic Republic of the Congo (10%). The second most widespread movement is the Qadiriyya brotherhood, which is followed by 11% of Muslims in Chad, 9% in Nigeria and 8% in Tanzania. Additionally, the Muridiyya order is prevalent in Senegal (34%), but it does not have a broad following among Muslims in other countries surveyed. In the other regions surveyed, affiliation with Sufi orders is less common. Only in Bangladesh (26%), Russia (19%), Tajikistan (18%), Pakistan (17%), Malaysia (17%), Albania (13%) and Uzbekistan (11%) do more than one-in-ten Muslims identify with a Sufi brotherhood. Several orders are prominent in individual countries, including the Naqshbandiyya in Tajikistan (16% of all Muslims), Chistiyya in Bangladesh (12%) and Bektashiyya in Albania (12%). The survey finds that the vast majority of adult Muslims were raised as Muslims. Nine-in-ten or more in all but four countries surveyed indicate that they had the same faith as children. In South Asia and across the Middle East and North Africa, nearly 100% of adult Muslims surveyed say they were raised in the Islamic faith. In Southeast Asia, conversion to Islam is similarly rare. Evidence of religious switching is found only in Thailand, where 3% of Muslims report growing up as Buddhists. In Central Asia and across Southern and Eastern Europe, conversion to Islam is more common, with 10% of adult Muslims in Kazakhstan, 7% in Russia, 6% in Uzbekistan and 5% in Albania stating they were not raised in the faith. Nearly all these instances of switching involve people who were brought up as atheists, agnostics or “nothing in particular” and later adopted Islam as their faith. In the 15 countries where the question was asked in sub-Saharan Africa, rates of conversion are similar to those in Central Asia and across Southern and Eastern Europe. The one exception is the Democratic Republic of the Congo, where 24% of those who are currently Muslim say they were raised in another faith. Unlike in Central Asia and across Southern and Eastern Europe, most converts to Islam in this part of the world report switching from Christianity or traditional African religions. For example, in the Democratic Republic of the Congo, roughly a fifth of Muslims (22%) say they were raised Christian, as do 11% of Muslims in Kenya and 10% in Uganda. Changing from Sunni to Shia, or vice versa, is relatively rare. In the case of Shias, only in Azerbaijan does the percentage of respondents who were raised Shia and who are currently Shia differ by as much as five points. Elsewhere the difference is two percentage points or less. Similarly, in all but three countries, the percentage of respondents who were raised Sunni and who are currently Sunni differs by five points or less. A slightly larger difference is found in Liberia, where 30% of Muslims were raised Sunni but 38% now identify as Sunni. In Nigeria and Niger, meanwhile, the percentage of adult Muslims who say they are Sunni is seven and six percentage points higher, respectively, than the percentage brought up as Sunni.